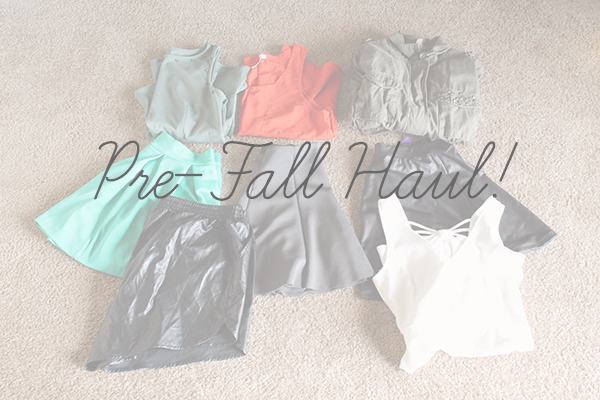 IT'S (almost) SEPTEMBER and that means it's the beginning of fall weather and fall fashion. Being that I live in a state that has little to no transitional periods (damn you Indiana and your ever changing weather), it isn't really conducive to my wardrobe or my wallet to buy transitional items. Also, I feel as if all clothes are transitional if you style them correctly. That being said, I did a little shopping lately to stock up on some miscellaneous fall things, and I'd thought I'd share them with you all! If you remember, or if you've been reading for a while, I had a faux leather skirt that I loved to death. Unfortunately, the zipper snagged and completely ripped the fabric, which was a heartbreaking moment. It took me close to a year to replace it, but I finally did, with this beaut. 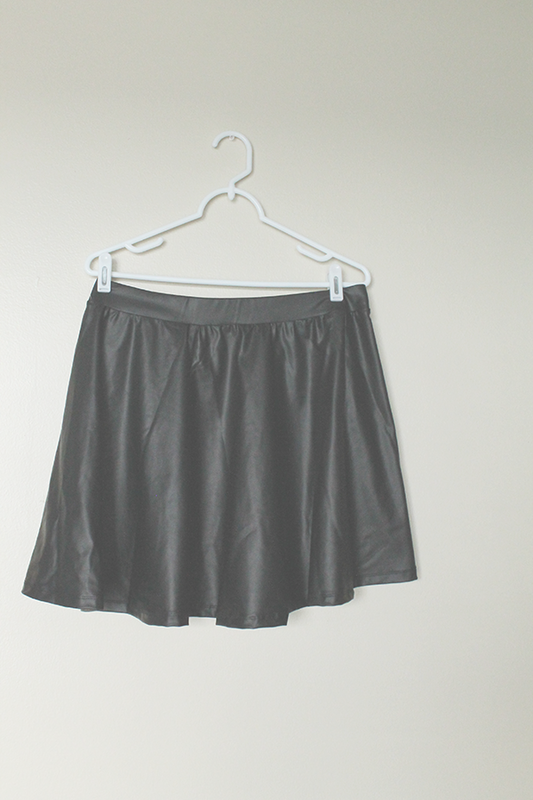 Just a plain, simple faux leather skater skirt from Forever 21. And, for under $10? I can dig it. I saw this cutie at Charlotte Russe a week or so ago, and though it is undeniably Summer, it was on sale for a whopping $5, and I had to get it. I can see it being layered with a dark jumper and some boots for a cute pop of color. 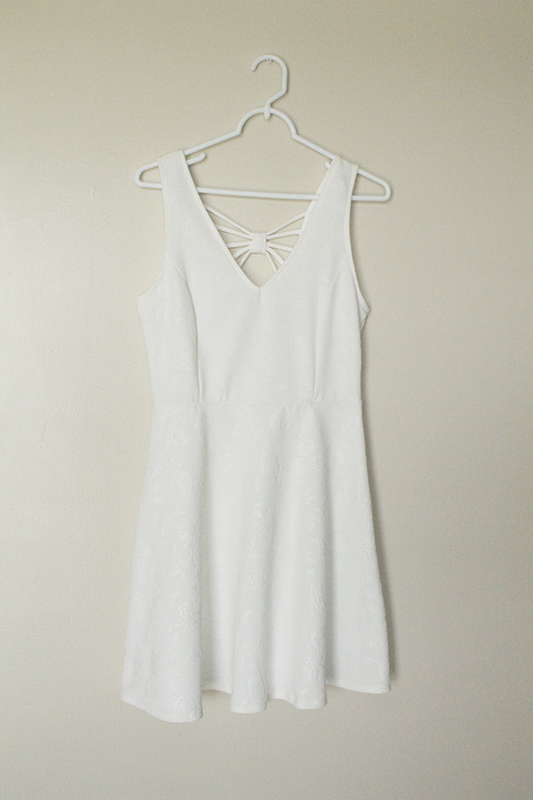 It reminds me of something a tennis player would wear, so soforth, I'm calling it the tennis dress. And, I hit the jackpot with thrifting. I was instantly drawn to this lovely burnt orange tank at the thrift, and it is the perfect color for fall. I'm getting excited just looking at it. The olive peplum blouse is heavy, so it's going to be warm, and it's also adorable, and will go great with my growing collection of olive colored items. Speaking of olive colored items, my new parka is a welcome to my wardrobe. This sucker is heavy. I wear it and I feel warm (and protected) It was only $5 at Goodwill and I couldn't leave it be! Though teal isn't a fall color at all, this teal skirt a pretty piece and I feel like I can make it work through out the year. 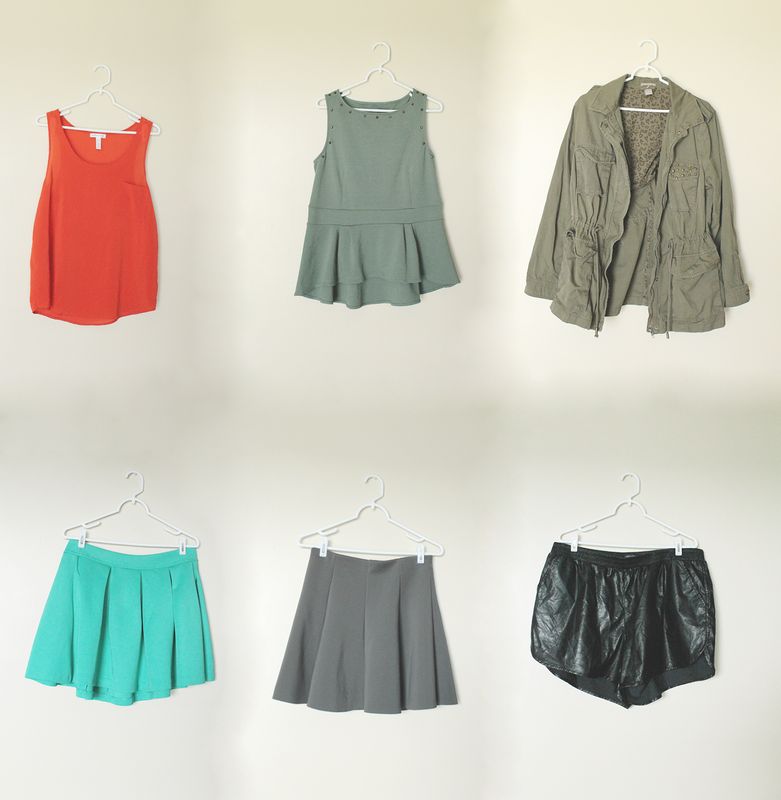 When I bought this grey pleated skirt, I thought it was shorts at first. But, alas, it's a skirt. It's still cute, and it's a great departure from the normal black skirts. And, finally, these faux leather shorts screamed at me. They're tacky--they look like a mixture between gym shorts from the 80s and genuine fashion and I am in love. I can just see me pairing it with ripped black tights, a white button down and a wide brim hat. Effortless fall outfit right there. Have you gone pre-fall shopping yet? What is on your agenda to buy?